Local Seo Guidelines - How to do Local Seo? 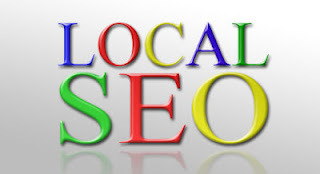 Local Seo has become a major success factor for local businesses. With Google becoming a major source of traffic for local business leads, local seo is slowly and gradually becoming an unavoidable marketing strategy for local business owners. Here are some guidelines that would help business website owners and search engine optimizers to do local seo more efficiently. The factors mentioned below plays a major role in getting your website ranked well on the Google local search results. 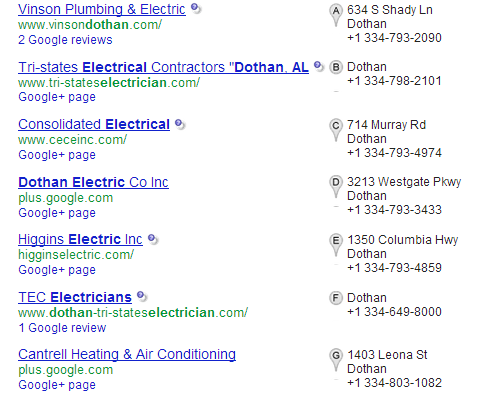 Here, a search for "Electricians in Dothan al" returns the following local results. Note the presence of keywords - "Dothan" "Al" and "Electrical". For a local listing to remain in good terms with search engines as well as the customers, it is important to keep the business name (brand name) in the title of the local listing. Also include the city name in the title as specified in the example above in order to get even more better visibility. To add an additional promotional factor, create a local Google Plus business page and optimize it as per the niche of your business including your main website reference from the page. The local business listing becomes your main showcase when you are promoting your site locally so verify it carefully, choose your main business address, correct pin code, correct business name, correct phone number etc. All these matters a lot in making your business stand genuine in the eyes of Google. The presence of your business in local business directories like Yelp, Yellow Pages, Super Pages, White Pages, Yahoo local listing, Bing local listing, Merchant Circle, Local.com, MapQuest, Insider Pages etc. Local citations and references of your brand name along with the business address is important. The more citations your business has from authority sources like Chamber of Commerce increases your chances of ranking highly on the search engines with respect to local keywords. Google takes into account the number of reviews that people leave in your local business page. The more reviews (of course the positive ones), the better is the chances of ranking. A little piece of advice here, do not try to add reviews from your side in order to manipulate the results as this won't do any benefit. Instead, try and improve the quality of your service and encourage your customers to share feedback on your main business page. If the customers talk good about your business then Google knows which business to rank higher! The listing which you will create must be accurate with full and complete details including address, phone number, photos, videos, website etc. Complete and accurate listings are preferred by Google. Considering the new Google ranking factors for 2013, it would be a nice idea to implement Google Authorship on your website. Site associated with a true professional profile will add more trust to the website and increase it's chances of ranking. It is important to have better understanding of Author Rank while promoting your website. A better author rank will ensure high trust with Google. Schema vocabulary can be a nice way to help the search engines process the content present in your web page in an easy manner. Specifying the postal address on your web pages using Schema microdata will surely add extra local relevance to your web pages. Apart from the locally relevant factors, the basic search engine ranking factors like the domain authority of the website is important. The higher the domain authority of the website, the better are its chances of ranking. Page Rank is still a value factor for Google. Hence, having a high Page Rank optimizes the popularity factor of your site. Quality and relevancy of backlinks pointing to your website increases it's authority and makes it easier for your website to rank well on Google. Citations (references) of your brand name along with your business address and phone number as mentioned in the business page are good factors holding a decent value in local rankings. SEO's Spending Too Much Time on Link Building? How Top Brands are Using Pinterest?